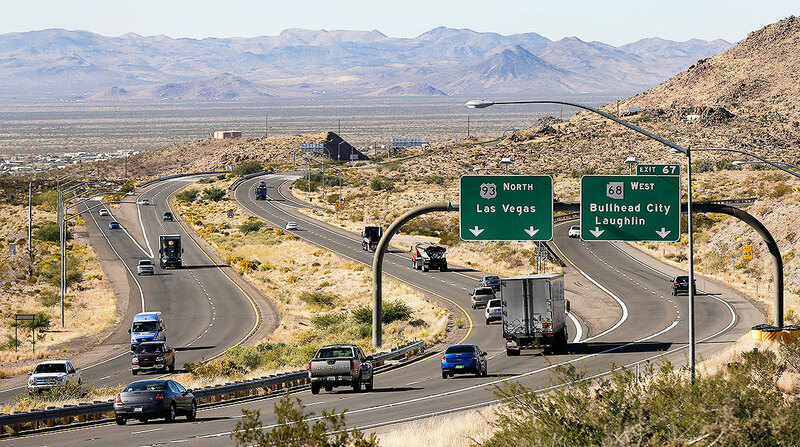 The Arizona Department of Transportation is widening U.S. Route 93, identified as an important artery along the future Interstate 11 corridor that will run through the state and into neighboring Nevada. U.S. 93 runs diagonally through part of Arizona, originating in Wickenburg (65 miles outside of Phoenix), then northwest to the Nevada state line and on through Las Vegas. Las Vegas and Phoenix are the two largest cities in the country that are not connected by an interstate. To create that link, the Fixing America’s Surface Transportation Act of 2015 formally designated I-11 throughout Arizona. That does not mean ADOT is charged with building an entirely new road from scratch. Rather, the designation identifies certain existing routes — including interstates 10 and 19, state Route 189 and U.S. 93 — that ultimately will form I-11. The widening of U.S. 93 near Wickenburg is one of four I-11-related projects that ADOT is using $155 million to complete over the next five years. Interstate highways must adhere to certain federal standards that are enumerated in the Federal-Aid Highway Act of 1956 and include: speed limits of 50 mph to 70 mph (depending on type of terrain), a minimum of two travel lanes in each direction, 12-foot lane widths, 10-foot right paved shoulders and 4-foot left paved shoulders. One of ADOT’s current projects is widening a 3-mile stretch of U.S. 93 near Wickenburg to a four-lane divided highway from one lane in each direction. The agency also will raise center medians and construct access frontage roads. All but 39 miles of the 200-mile drive from Wickenburg to the Nevada state line have been upgraded to a four-lane divided highway, according to ADOT. “Every step we take to improve U.S. 93 gets us closer to the reality of I-11 through that particular area,” ADOT spokeswoman Laura Douglas told Transport Topics. As for the other three projects, one will widen a 3-mile stretch of U.S. 93 near Wikieup, which is 75 miles northwest of Wickenburg. Another will involve the construction of an interchange in downtown Kingman, which sits 70 miles southeast of the Nevada state line at the intersection of U.S. 93 and I-40. A project slated for construction in fiscal 2025 will widen another stretch of U.S. 93 near Wickenburg. Steve Heron, director of fleet operations at OnTrac Inc., said these projects will ease congestion for the freight moving from Phoenix through Nevada. OnTrac, based 20 miles southeast of Phoenix in Chandler, specializes in the movement of parcels and small packages. It ranks No. 57 on the Transport Topics Top 100 list of North American for-hire carriers. The widening of U.S. 93 is an important safety measure, said Arizona Trucking Association President Tony Bradley. He recalled a time when it was one lane in each direction. Bradley said that, in its narrower form, the winding U.S. 93 could be difficult to drive. Douglas said that ADOT’s work to form I-11 involves more than improving U.S. 93. She said ADOT is conducting a study to determine the exact route I-11 will follow from Wickenburg to Nogales, which toes the border with Mexico and is home to a port of entry. State Route 189, the short but vital 4-mile stretch that connects the border with I-19, will need improvements to meet interstate standards, Douglas said. The long-term vision of I-11 extends past Arizona. After linking Las Vegas and Phoenix, the goal is to connect Canada to Mexico. Douglas added that a cohesive corridor will ease the movement of people and goods. According to the U.S. Census Bureau, Arizona’s population has grown nearly 10% since 2010 to more than 7 million people. The Nogales Port of Entry, which the completed I-11 will touch, is Arizona’s busiest port for freight. The Bureau of Transportation Statistics indicates 27,043 trucks moved through that port in June. The next busiest port, located 116 miles east in Douglas, saw 2,353 trucks in June.